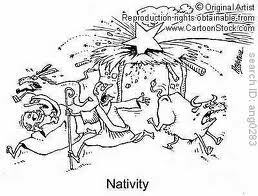 My class were doing a creative writing lesson based on the story of the Nativity. The story had to be written from the viewpoint of one of the animals in the stable. I tried to stress that as an animal you would not understand what was going an. Also, if you were a smaller creature you would be looking at things from a completely different angle. So to help us, we took a moment to place ourselves in our animal's body and imagine the sights, sounds and smells that we would experience. R took his assignment very seriously. He imagined that he was a little mouse, peering out from under the straw. Classic. I didn't have to read any further to award him an A+ for his work! Dam those New Year's Eve superstitions! The Mystery of the Missing Lights.